You will experience exhilarating steep ascents and descents through Crater and the Negev Desert dunes with panoramic views of the spectacular Ramon Crater. 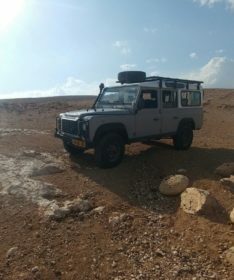 We will see the nomadic life of the desert birds and animals, and hear about the history, geology, flora and fauna of this unique ecosystem, and learn about the history of Israel’s Bedouin culture. You can arrange either a 2 or 4 hour jeep tour.